1.High efficiency drilling and processing welding groove. 2.CAD/CAM direct conversion, automation and high precision processing. 3.Double gantries double stations structure, two short tubes can be processed at the same time, long tube can be processing with double gantries. 4.Independent drive of each gantry, gantry numbers can be designed by customer''s requirement. 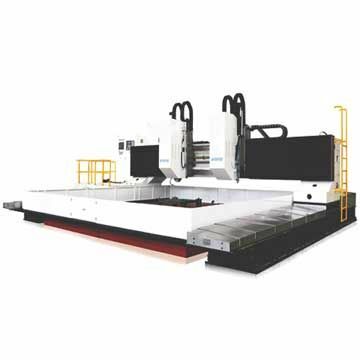 5.Each gantry can be used as an independent processing unit, process different workpieces at the same time, also can online process the same workpiece simultaneously. 6.Tube supporting bracket, lifting supporting bracket and fixed supporting bracket 2 types, lifting supporting bracket lifts workpiece when rotates, and lower to fixed supporting bracket to prevent workpiece from slipping. 7.CNC dividing head, each is installed on both sides of machine bed, can set X axis movable, equipped with self centering chuck, convenient for workpiece clamping. 8.Slide-type drilling head BT50 spindle, with super large torque output capacity, spindles adopt synchronous pulley type. 9.Electrical system, machine adopts FAGOR 8055M or SIEMENS 808D CNC system, with RJ45 interface and LCD, CAD/CAM coordinate conversion can be achieved directly, with preview and review functions before drilling, very easy operation.